"Um... Um... Do you take sugar?" 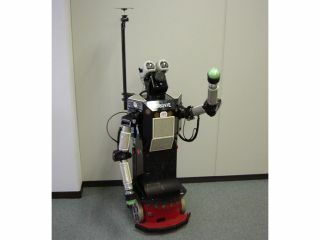 Takayuki Kanda and colleagues at ATR Intelligent Robotics & Communication Labs in Kyoto and Keio and Osaka universities studied how satisfied human volunteers were with the responses of domestic robots. The team found that any delays in responding to spoken commands, such as an order to fetch a nice cuppa, were tolerated only up to two seconds – anything longer was plain annoying. However, if the robot was able to throw in very human verbal fillers such as "um…" or "well…" during a longer delay, user irritation evaporated and the hold-up went unnoticed. Kanda told us how his team got the idea: "This research started from real needs, where people interacting with our robot lost their motivation to continue talking with it. "This became clearer when we put the robot in the field (a station and a shopping mall) as an explicit information-providing service. The problem for the user was not the fact that he didn’t receive a full answer, but the fact that he didn’t know whether the robot was working or not." In other words, those seemingly meaningless mumblings actually serve the very important function of letting us know that something, rather than nothing, is going on in the heads of our metal friends.